Everyone loves a good story. Regardless of where we are on life’s continuum, a well told story can be a powerful source of encouragement and motivation. An interactive workshop on storytelling at the 5th Annual Pipeline Grantee meeting cemented the notion that a story saturated with vivid detail about triumph over trials is inspiring. Earlier this fall, storytelling as an inspirational tool was put into action to complement dental student orientation events at West Virginia University. The School of Dentistry hosted a dinner program, Dental Pipeline: Transforming Dreams into Reality, where new and returning URM/LI dental students and select faculty and alumni came together for an evening of motivational reflections. In a relaxed ambience, away from the formal classroom setting, students listened to inspiring “once upon a time” commentaries by accomplished dentists. The keynote speaker told a story about her experience as the only woman in her dental class and how she persevered when faced with a series of family tragedies. Early in the dental school experience, her father was diagnosed with cancer and on the day of his surgery her mother died. A few months later, her grandmother passed away followed by the death of her sister-in-law, which was a result of a drunk driver. The audience was completely engrossed in her coping abilities amid tragically diminishing family support and mounting academic challenges. Another alumnus from a rural upbringing and the first in his family to enter the health professions stressed the importance of developing “brothers and sisters” in the dental profession – faculty and classmates who you can turn to while in dental school and beyond. “These people will coach and cheer you in both difficult and good times,” conveyed Dr. Maurice Lewis, a 1978 WVU dental graduate. The storytelling event forged a nexus between aspiring and accomplished dentists. 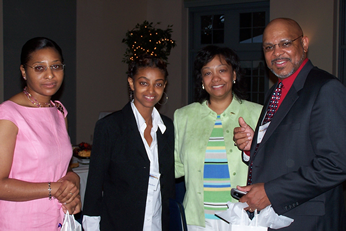 It offered a retrospective window into personal struggles and successes on the educational journey while providing a unique rapport-building opportunity. The program’s inspirational merit is evidenced by students’ unspoken and spoken reactions. “I was inspired by the speakers at the Pipeline dinner. I have been feeling a bit overwhelmed… it helped to hear from individuals that can identify with those feelings. Their words of encouragement lifted my spirit and comforted me greatly,” commented a first-year dental student. 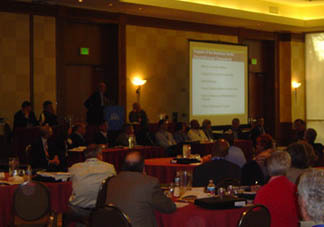 On November 5, 2006 representatives from the Dental Pipeline were back in La Jolla, CA for the ADEA Council of Dean’s meeting. Their mission was to discuss progress on the Dental Pipeline initiative to deans, associate and assistant deans, and others from dental schools across the United States and Canada. Armed with 2005 statistical data showing a 64% increase in URM first-year enrollment and a 105% increase in community-based clinic time, Dr. Allan Formicola, Co-director, spent half an hour painting an in-depth picture of the program. His presentation included a special program video that was created to summarize the Dental Pipeline’s various components. Dr. Formicola was followed by two panels of Dental Pipeline school representatives that discussed the challenges they have faced and how they overcame obstacles. Another panel described how the Dental Pipeline program created the environment for major change in the dental school and how the Dental Pipeline program addresses the critical issues the profession faces. By the end of the Council of Dean’s generous two-and-a-half hour allotted time, over 150 deans as well as many others were energized and ready to tackle URM recruitment and enrollment and community clinic rotations. In the National Program Office’s eyes, the session was a great success thanks to the dedication and hard work of the Pipeline deans, program directors, and NPO staff. Thanks to the continued support of the Robert Wood Johnson Foundation, the National Program Office was able to provide a new grant opportunity for currently funded Pipeline schools. Dental Pipeline Connections consisted of grants of up to $50,000 intended as “seed funding” for developing or enhancing URM mentor programs. After reviewing many compelling grant submissions, the Connections Review Committee, drawn from the National Advisory Committee, has awarded grants to the dental schools at the University of Southern California, University of Illinois at Chicago, University of Connecticut, and Meharry Medical College. Congratulations to the grantees! For more information on Connections, contact Mila Susnjar at 212-304-7213. Congratulations to Gerardo Mercado, a freshman at USC School of Dentistry, who received a $10,000/year loan from Delta Dental. If Gerardo chooses to practice full-time in an underserved, Hispanic area after graduation, the loan will convert to a scholarship and be forgiven at the rate of $10,000 per year of practice in the underserved area. The Robert Wood Johnson Foundation (RWJF) recently chose the University of Illinois at Chicago College of Dentistry to receive two American Dental Association (ADA) Foundation Under-Represented Minority Dental Student Scholarships. The College was one of only five in the nation to be so honored. The College awarded the scholarships to D-1s Aminah Ricks and Donnie Rivera. A total of $17,500 per student will be provided in annual increments of $4,375 to each individual over four years. The University of Illinois at Chicago College of Dentistry has received the 2006 Annual Human Relations Award from the City of Chicago Commission on Human Relations. The college was honored for its efforts to bring dental care to poor, racial and ethnic minorities, and people who lack dental insurance. The Dental Pipeline website has been updated! Throughout the last three years, the National Program Office has maintained the website and established a strong online presence. But over the last few months, they have worked behind the scenes to reorganize, redesign, and update the site. The goal was to increase ease of navigation and refresh its look and feel. The site will continue to complement the amazing work that the Dental Pipeline schools have done while helping to further disseminate the initiative’s success. Visit the improved website at www.dentalpipeline.org, and let us know what you think! Email Celia Cameron, Communications Specialist, at cc2630@columbia.edu to share your comments.